Your key chain can hold the key to survival when you travel with The Res Q Me Keychain Escape Tool ! The Res-Q-Me Keychain Escape Tool is a small pocket-size version of the Life Hammer Auto Escape Tool. Just like the Life Hammer, the Res-Q-Me shatters car windows and cut seatbelts in seconds. I always like to be prepared, most of us do. When I was in school, I studied so I would be prepared for tests. When I took driver’s ed, I studied to be prepared for driving. Now, I am prepared for the biggest driving test of my life, knowing that I have done everything possible to ensure I could survive a car accident. This is a test that doesn’t come with a guide or a manual, as circumstances are different in every accident. Usually, safety belts and air bags reduce impact on passengers in crashes, but sometimes they hinder the situation, causing entrapment. Innovation, the designers behind The Life Hammer, have made a key chain sized safety device that can travel everywhere you go. Be prepared with The Res Q Me Keychain Escape Tool. Seat Belt Cutter. It is not uncommon for a safety belt to malfunction in an accident. Infants also can be entrapped within their car seats, and when time is crucial you need to make sure everyone is safe from harm. This tool is able to cut through seat belt material in seconds, simply hook the tool over the belt and pull. The sharp steel blade is protected for your safety as well. Break Windows. The Res Q Me features an ingenious spring loaded system for shattering tempered glass. Simply push the flat surface against a window until the concealed spring loaded spike releases to break the glass. Only 12 pounds (5kg) of force is needed for use. With this device on your key chain, you become a safety provider to others as well, including parents and pet owners. It is not uncommon anymore to come in contact with a person who has locked their child and/or pet inside their vehicles and are in need of emergency help. This device is also crucial if you are the first person to the scene of an accident and need to help open a jammed door or break a window to help another. Guarded Blade. The guard protects you from injuring yourself or another person. 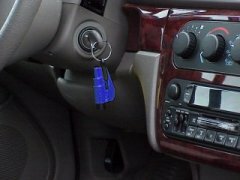 You can safely detach the Res Q Me from your key chain without removing keys from the ignition. Compact Size. This tool is 3” long, and can easily be stored in other areas of your car as well as your key chain. Visors and seatbelts are two common places to keep a Res Q Me. Feel peace of mind knowing you have chosen a safety tool that is approved and recommended by EMT, Police and Fire units worldwide, and The American Fleet Association. Q: How big of an area will the Res Q Me be able to cover with a single use on a tempered window? A: Used on the bottom area of the window, the Res Q Me will break enough glass for you to be able to wrap your hand around the door and unlatch the door from the outside. 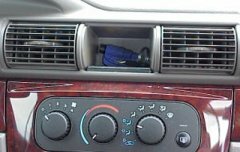 Use it multiple times on one window to break enough area glass to exit the vehicle. Q: I read somewhere that the Res Q Me works great for cutting car seat restraints. True? A: Yes, it’s a life saving device for the smallest of passengers. Car seat restraints are hard enough to release, particularly while under stress, so it is imperative to have the Res Q Me handy if you are a parent with a small child. Microfiber ProductsPadsExterior Car CareInterior Car Care3D Outlet StoreCar Brite Car CareRealTree Window Decals - CLOSEOUTMcKee's RV Waxes, Cleaners & Polishes- CLOSEOUTJay Lenos Garage Advanced Vehicle CareBattery TenderRupes BigFoot LHR21 MarkII Random Orbital Polisher - On Sale!Rupes BigFoot LHR15 MarkII Random Orbital Polisher - On Sale!Ultima Flawless Finish SystemFinland EEC License PlateBuff and Shine 3.5 inch Blue Dressing ApplicatorJay Leno’s Garage Snapback HatJay Leno’s Garage Front Mount T-ShirtJay Leno’s Garage T-Shirt32 oz. Meguiars Super Degreaser Bottle32 oz. Meguiars Citrus Power Cleaner Plus BottleRaggTopp Convertible Top Plastic Window Cleaner & Protectant Kit Free Bonus! EVERYONE who has a vehicle, or rides in one should have this on their key ring or their person ! Period !